The Gold Coast in Queensland has one of the most amazing ocean beaches that stretches with a few interuptions with headland and waterways from the Gold Coast Seaway in the north to Rainbow Bay at Coolangatta in the South. Along the entire coastline the sand is clean, soft and inviting. The water is clear, clean and warm. No matter where in the world I travel, I compare all beaches to these ones! ......or just relax with a book and a view! The Gold Coast has it all. And best of all, the beaches are brilliant ALL year round! Check out your best time to visit on the Gold Coast for your beach vacation! To holiday next to the beach I recommend the following suburbs. Each one has unique attractions and no place is better than the other overall - just different. Main Beach - ocean beach which is good for families at low tide, kite surfing, surfing and swimming between the flags. Broadbeach - ocean beach good for families most of the time, observe the surf life saving directions and always swim between the flags. Mermaid Beach - ocean beach, sometimes it gets a little rough here but good for kite surfers. Burleigh Heads & Nobbies Beach - ocean beach with a point break at Burleigh Head which is good for surfing. Headland can break the wind depending upon the direction. On the headland there is a walkway and some rocks. 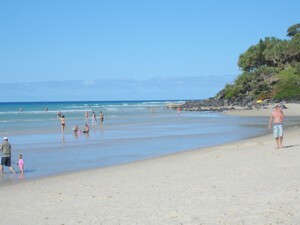 Tallebudgera - Ocean beach and beach in the creek which is really lovely. Sometimes you can see dolphins coming up the creek! Currumbin - ocean beach can be a bit rough near the mouth of the estuary into Currumbin Creek. Good for surfing. Some beaches on the estuary which are better for families. Currumbin Creek is popular with kayakers. Kirra - famous for surfing! But amazing expanse of sand for families. Coolangatta - point breaks running into Kirra for the Surfers, has fabulous beach areas including some of my family favourites, Greenmount and Rainbow. These are very family friendly. Round the corner is Point Danger and Duranbah for which are good for surfers. 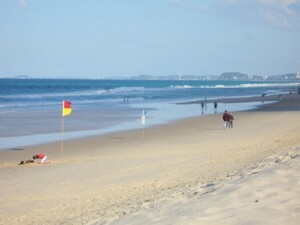 The beaches of Coolangatta face mostly north, so you get wind shadow when the easterlies and southerlies are blowing. That depends upon what you want to do, when you can come, your budget and what kind of weather you'd prefer! Check out my guide to the best time to visit the Gold Coast. Want To Know What To Do In The Gold Coast? So many things to do, so little time - take the challenge check out the Gold Coast main attractions and plan your trip to make the most of it.